“Whose big idea was it to build a green driveway anyway?” I jokingly asked my husband, Bill, as we shoveled chip gravel into a rickety wheelbarrow for the 120th time that day. He admitted to some dumb ideas in the past but put the blame for this one squarely on my shoulders. Yup. There we were toiling like real laborers in the 84F/ 29C heat. I reminded him that we already had a landscaper willing to have 3 guys here for 3 days to build it. But he coaxed me on by saying, “I just want to see how much I can get done.” I think he was feeling nostalgic for his younger days when he briefly ran a small college landscaping company – but that was over twenty years ago! Hmmm. OK. Well, I certainly couldn’t go on my regular 5-mile walk, or lift free weights, when there was real, physical labor to be done to build our green driveway. So, let’s begin. And please, no standing around! Pick up a shovel and get to work. Now, if your main goal is to build a green driveway of this type, you will not need nearly the quantities we ordered (some of it was destined for our backyard). But you will still need loam, sand and gravel. You can use a soil calculator to estimate how much you’ll need of each, based on the area to be covered and the depth of each material. More details as we progress. Bright and early on Saturday morning, the Earthco truck pulled up and dropped off the chip gravel (also known as HPB or High Performance Base). A second truck delivered the Brick sand. Most gravel and aggregate companies can only ship one material at a time, so the delivery fees add up quickly. Tip: Order in as large quantities as possible to minimize (or eliminate) the delivery fees which can equal or exceed the cost of the goods. We’d already cleared, and excavated the area by bobcat (Destroy to Create ), so the first step on Saturday was to move the mountains of soil, sand and gravel into the right places and level everything out. This was a little tricky as the twelve tonnes of chip was covering up the future driveway, sixteen yards of soil was where the flagstone footpaths were to go, and the six tonnes of sand was where we wanted the garden. Two people are going to move all this by hand? I was a bit incredulous. I’ve never shoveled much in my life, but I remembered the laborers in 2003 who had dug deep trenches around our house for waterproofing. They didn’t stop or even look up. One shovel after another until the trench was dug. That memory helped. We both got into a steady rhythm of shoveling. 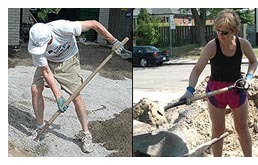 I pretended not to notice that Bill was matching every shovel I put in with one of his own. Was he competing with me? You bet! He commented that I must have worked in a ‘gulag’ in a former life. The gulag reference was a bit odd, but I took it as a compliment that I was pulling my weight. By the evening we’d distributed everything to the right places (mostly). A good workout, but the green driveway still appeared to be an elusive figment of our imagination. Amazingly, I wasn’t stiff or sore when I woke up – the weight training thankfully makes a difference – but I didn’t really expect that we’d be putting in a second full day of shoveling. I imagined we’d put in a few hours and then leave the rest for the landscapers. Mr. Bill’s (aka the foreman) objective for Day Two was to ‘place and compact’ the 1/4 chip gravel over the entire driveway area (10 ft x 30 ft). We already had a sub-base of clear gravel. It was very coarse, and although the instructions from the manufacturer say it’s okay to use, it is difficult to level because each piece is so chunky. Fortunately we were laying the chip on top, so the bigger gravel was covered up. 1. Shovel into a wheelbarrow. 2. Dump onto the driveway area. 3. Spread evenly with a straight tined gravel rake – and then compact. We rented a compactor from a nearby rental store. (It’s the orange machine in the photos below.) It was absolutely essential. Proper compaction of each surface ensures a solid base that guards against unevenness and future craters. If all we were doing was the green driveway, we could have moved on to the next step – covering the driveway area with the 50/50 loam and sand mix. But we were also creating footpaths and a garden area in the remaining 2/3 of the front yard. So we dug trenches 24″ wide by 12″ deep. Then we poured the 1/4 chip in – and voila! After compacting, we had a good firm base for the flagstone footpaths. We felt a sense of accomplishment. We could finally ‘see’ the landscape layout that I’d drawn on paper becoming real. We had the u-shaped path. The garden was in the middle. And the driveway was laid out. We hugged and celebrated with a late candlelit dinner. The joys of being self-employed are that you can have a holiday whenever you want (in theory anyway). So we pushed off some deadlines, and proclaimed a ‘holiday’. We were determined to ‘get it done’. No excuses… e.g. our soft hands were developing a few calluses and looking a little worse for wear. All along we’d been following the manufacturer’s instructions. We were now on Step 4: Add 1″ layer of porous backfill mix (50% sharp sand/50% loam). Moderate compaction. How can you ensure you have a 50/50 mix? Well it doesn’t come premixed, so we shoveled one scoop of sand for every scoop of Triple Mix soil into the wheelbarrow. Then we dumped it onto a sheet of old plywood and mixed it like we were baking a giant cake. That 50/50 mixture got shoveled and raked over the 1/4 chip gravel base. Bill drove the compactor. It reminded me of pushing a vacuum cleaner but I didn’t mention that metaphor lest it take the macho fun out of it. Step 5: Laying out the PermaTURF. Finally we were on to the exciting part! Laying out the PermaTURF. Each 13″ x 13″ plastic honeycomb panel snaps into place so they interlock on four-sides. This prevents horizontal or vertical movement and provides a load-bearing surface strong enough to drive on. You can imagine this is critical with the huge weight and force of a moving vehicle. As we laid the panels, I stood back and looked at what we were creating. It looked like a giant toy puzzle on the ground. It was quite beautiful – and every passerby asked questions. We really had a ‘green’ driveway, now! 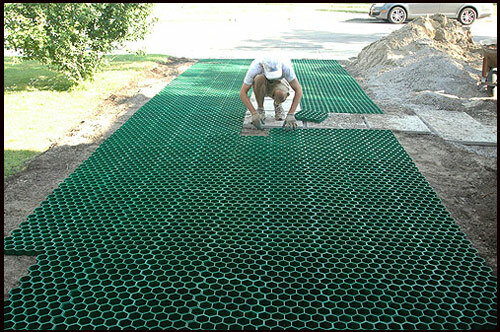 The final step in creating the green driveway, is to fill the panels with grass seed. Using sod would create an instant green driveway — and I considered it. But it’s not recommended for our cold winters because the roots don’t go down as far as with grass grown from seed. However the irony is that our summer weather is so hot (forecast today is 91F/ 32C), that it’s recommended that we wait for cooler weather to plant the grass seed. Tune in for the next installment via the RSS feed or My Green Conscience widget. Thanks Franke, for sharing your green driveway adventure! Why do folks feel the need to cover the earth with so much concrete? I always wonder. As always I’m fascinated by what you and Bill manage to accomplish. Where others are disgusted or intimidated by various government/legal obstacles, you just consider them challenges… Everybody, forward Franke’s essays to your friends, and anyone else whom you think would benefit. Thanks Roz for the wonderful vote of confidence. Much appreciated! Where can these PermaTURF plastic pavers be purchased? I love your story…and of course the results of your hard work and determination. Both my neighbour and I need new driveway surfaces and I told her about the eco friendly kind that I saw in a magazine a number of years ago. I hate the radiating heat from the asphalt, and knew about the rain runoff issues. (I’ve already banished the lawn to low maintenance shrubs, trees and flowers.) She has agreed with me that if we do it together, we could set the trend so that our neighbours might follow suit. After reading about your project, I think it’s time to convince the men in our lives that we CAN do it if we really want to. We have the muscle, now all we need is the money!…oh yes, and the permit! (P.S. another nutty by-law..in some neighbourhoods you are not permitted to have a clothesline!…we put up an umberella clothes line in our yard when we moved in, 7 years ago. This past summer, 2 of my surrounding neighbours installed the same in their yards! Yea! I’m in search of a pervious driveway. I am considering building a garage and now would be the time to replace my asphalt driveway that is deteriorating. I would like to find an aesthetically pleasing and practical solution. My driveway is probably 500′ – 1000′ long depending whether I address the shared entrance. I have a fairly large grassy lawn in front of my house with a driveway that borders the lawn. I would like to install something that indicates where to drive as I don’t want people driving over the lawn and I would like a surface that can be plowed in the winter. I like gravel, but it requires too much maintenance from the winter plowing. 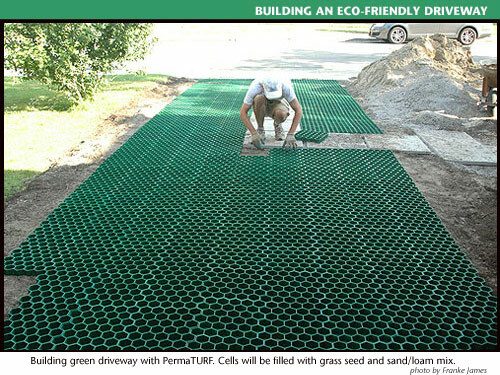 If I chose the perma turf plastic pavers how would people distinguish the driveway from the lawn? I would appreciate your advice. can you post a picture (or a link to a picture or send me picture) of what your drive looks like now. I live in Mississauga, the city just added a new stormwater tax (http://www.mississauga.ca/portal/stormwater/charge), and my asphalt driveway is in terrible condition. We sold our home in Toronto in June 2014. The new owners replaced the green driveway with a stone driveway. A stormwater tax may be just what’s needed to change it back again! Thanks for letting me know about it. Franke, your green driveway is looking very beautiful and I admire the work and planning you have done. Hey Franke! This green driveway is looking very beautiful. You guys have done a great job. I see that you have sold this house but for the time you had the green driveway, what maintenance was required? Were there issues with shoveling snow or growing grass in tire tracks? What would you expect for longevity?